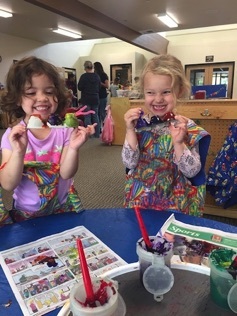 Children must be at least 24 months old to start at Applegate and children can attend until they start Kindergarten. To be placed on our waiting list, you must submit an application along with a one-time application fee of $50. You can download an application from the link below, or call the school and have one mailed to you. The average wait for the morning program has often been as long as 18 months to two years. The wait for the afternoon program is much shorter. Enrollment for the following fall begins in March, however we accept applications year round. Applications are kept on a list in order of your original application date. Once you have been offered a space, we will schedule a time for you and your child to visit the school before you need to make your final decision. We regret that we are unable to offer visits at the time of application since we receive too many requests to be able to accomodate everyone.